Halloween Fortune - best Haloween Slot in the WEB! This five-reeler is played on 20 paylines and involves a variety of colorful characters and special features. Starting from smokin’ hot witches and their brooms, cats, and hats, to magic potions, ravens and skulls, Halloween Fortune has got all the spooky elements with an exciting and cartoony twist about them. 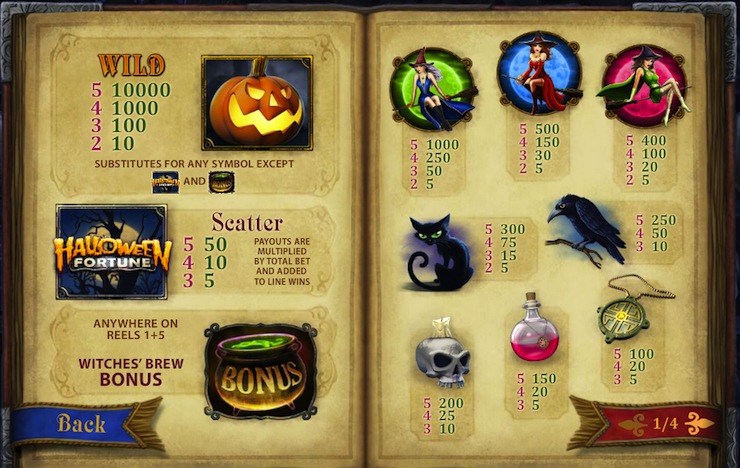 In addition to the regular line wins, which come in abundance, so there’s no need to worry about costs, this slot also involves a number of special features, such as carved pumpkin wilds, slot logo scatters, as well as a Witches Brew bonus round that awards free spins and multipliers and a Gamble feature, for those who like to take an extra step and put even their winnings to a risk. When it comes to finances, as mentioned before, there’s not much to worry about. Apart from being affordable from the winning aspect, Halloween Fortune offers a variety of bet amounts that will fit every punter’s budget. Thanks to the wide range of coin denominations – from as little as $0.01 to $5, and the possibility to select the number of paylines to play on, “Halloween Fortune” provides players with more than enough possibilities, enabling them to place precisely as much as they intended. The only suggestion is to keep the number of paylines on the maximum 20, as this will maximize your winning chances and result in more prizes.